Search results for "Andrew Jackson Downing"
Today the Landmarks Preservation Commission (LPC) voted to designate eight items as New York City landmarks. The designees—churches, residences, and one lighthouse—were part of Backlog 95, the LPC's initiative to consider 95 items that have been up for designation for years, sometimes decades. The map below shows the location of the city's newest landmarks: The LPC granted landmark status to three Staten Island houses: The George William and Anna Curtis House, St. John's Protestant Episcopal Church Rectory, and the 92 Harrison Street House. The George William and Anna Curtis House was nominated in 1966 and prioritized for backlog clearance in November of last year. The 1859 Italianate-inspired home belonged to a couple active in the abolitionist movement. The Curtis's built their home from Andrew Jackson Downing's pattern books, and George William, one commissioner noted, was in contact with the illustrious Frederick Law Olmsted. The half-timbered Queen Anne–style St. John's Protestant Episcopal Church Rectory from the 1880s, with an almost original historic facade and interiors (although these are not considered for landmarking) was designated. An 1853 Greek Revival home, the 92 Harrison Street House, received the commission's blessings despite the owner's ambivalence and borough president James Oddo's concern about the designation. LPC chair Meenakshi Srinivasan was enthusiastic about the new landmarked homes. "Staten Island is home to many 18th and 19th century homes. We are pleased to bring three of these houses forward. Not only are they architecturally interesting, but the social and cultural history of the occupants adds additional distinction." 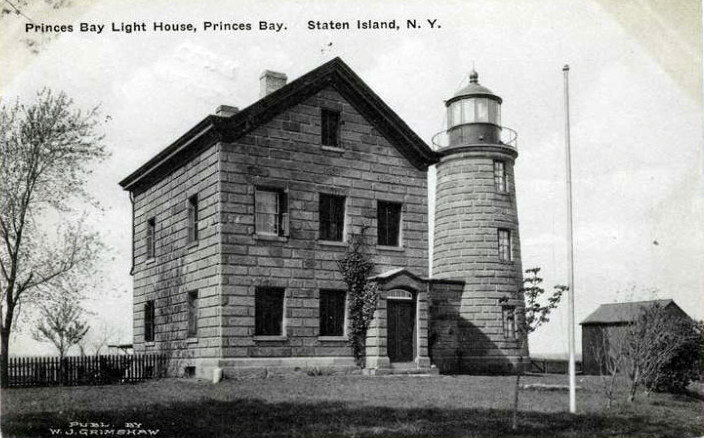 On the South Shore, the commission designated the Prince's Bay Lighthouse Complex, a suite of vernacular 1860s buildings that includes a lighthouse (whose luminous feature was replaced by a statue of the virgin Mary in the 1920s), a keeper's and carriage house. The complex represents the maritime industry that once thrived on Staten Island, commissioners noted. Across the harbor in Manhattan, the LPC voted on two Tribeca properties: 315 Broadway, and Italianate-style "commercial palace" from the 1860s, and 160 Chambers Street, the (Former) Firehouse Engine Company 29. 315 Broadway reflects the neighborhood's history as a dry goods storage mecca, with its handsome marble facade and (partially concealed) cast-iron storefront. 160 Chambers, a Second Empire–style row house that was converted to a firehouse in 1868. Architect Nathaniel D. Bush added two stories and a mansard roof to the three-story row house, which has since been returned to its original residential use. In Harlem, the commission designated two churches, St. Joseph of the Holy Family Roman Catholic Church and St. Paul Roman Catholic Church. The former, an 1860 structure, was praised for the "simplicity and elegance" of its Rundbogenstil (round arch–style) design. The Romanesque Revival St. Paul's church and school, constructed almost 50 years later, sports medieval and classical features on the facades of both buildings. The history of landscape architecture in America goes back to the writings and activism of Andrew Jackson Downing and, of course, Frederick Law Olmsted. While there has always been a segment of the profession that focuses on estate gardening and horticulture, there are other firms who have a more socially engaged and expansive view of the profession. One thinks, for example, of Thomas Church, Dan Kiley, Lawrence Halprin, and Garret Eckbo, who all brought new ways of thinking and transforming the built landscape but primarily focused on the public nature of their practice and commissions. Perhaps the most famous of these figures was Ian McHarg, a Scotsman who founded the Department of Landscape Architecture at the University of Pennsylvania, but who more importantly brought a renewed emphasis on urban planning and what he called “natural systems” (with his 1969 book Design with Nature) into the profession. Today, landscape architecture combines McHarg-influenced environmental awareness, city planning, storm water management, and aesthetic concerns of the in-between spaces we inhabit in the city. This public nature of the profession is the focus of many firms today—no more than at the New York office of Mathews Nielsen Landscape Architects, who work almost exclusively on public, state, and institutional projects. 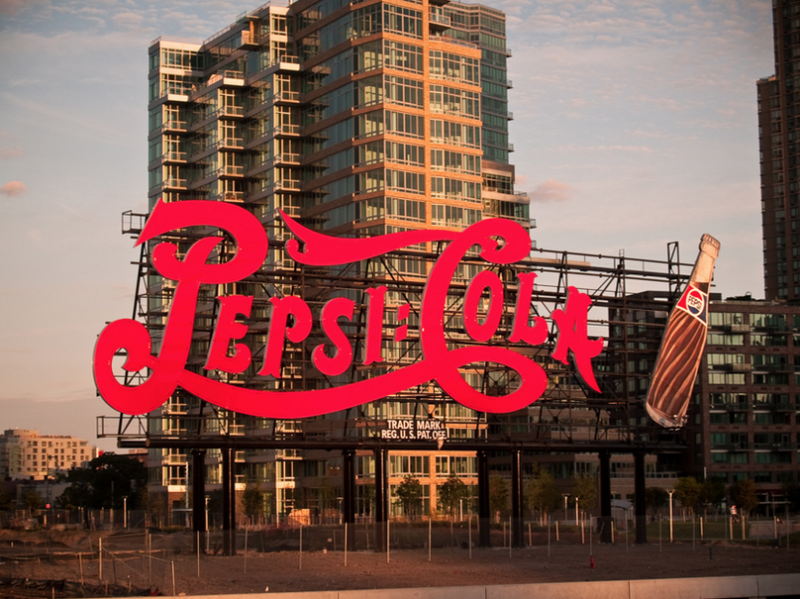 More than nearly any other firm, they have transformed the postindustrial landscape of New York. It is very important, Signe Nielsen said, “that our work is publicly accessible and as a result we don’t generally do private residential projects or we don’t do green field sites, i.e. commissions to transform farmland into housing or forests to shopping centers.” Improving the life of everyone in the city is important, and if there is a social justice component, then all the better. This transformation of Food Center Drive takes one of the least pedestrian-friendly and polluted boulevards in the South Bronx and makes it a public amenity. 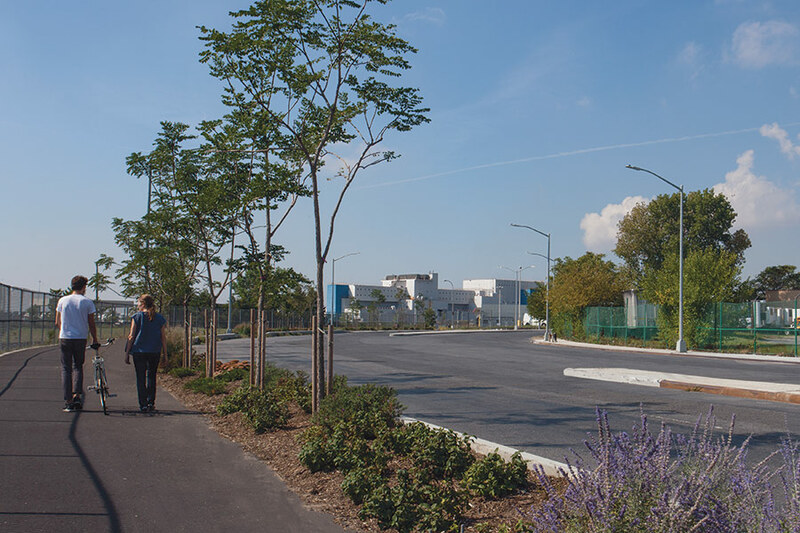 This mile-long route serves as an entry into the city’s Food Distribution Center for its 16,000 employees and those who live around the center. The design evolved out of Mathews Nielsen’s earlier South Bronx Greenway Master Plan and creates a shared pedestrian vehicle path by reconfiguring the traffic pattern to a one-way loop, thereby reducing the road from six to five lanes. But even more it incorporates innovative storm-water capture and biofiltration strategies to contribute a significant new biomass. Within the median and new greenway buffer, there are over 700 trees in addition to understory grasses and shrubs. The project is scheduled for completion in October. 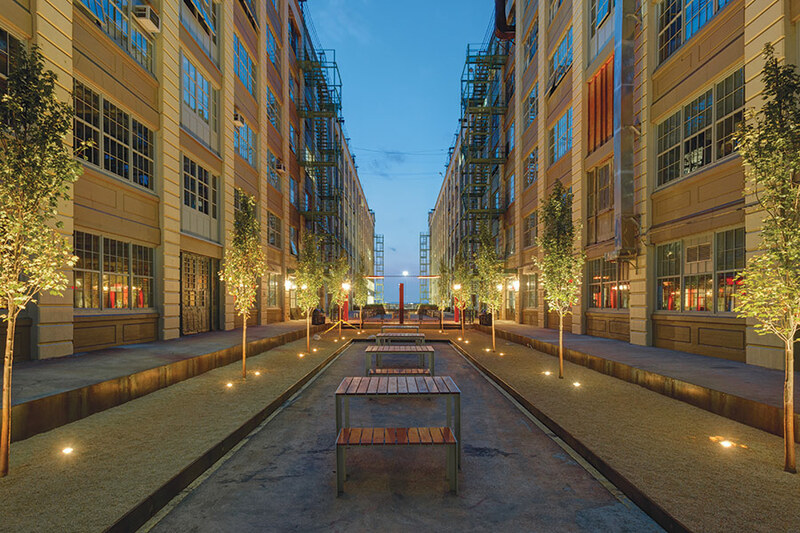 The redesign of Brooklyn’s long-derelict Industry City courtyard is a model of how to take an impressive, but slightly oppressive interior open area and make it desirable. The space divides two 600-foot-long buildings (and a shorter third side connecting structure) with 33,000-square-feet of courtyard space open toward Gowanus Bay, the sunset, and a glimpse of the Statue of Liberty. To complement the large mass and immensity of the overall space, they used a plant palette of ferns and various monotone greens laid out in large directional swaths. Further, the form of the columnar maple trees plays off of the repetition of the building columns as well as the industrial smoke stacks and ventilation pipe remnants. Trees were chosen for the beautiful red fall color that will inevitably complement the weathering steel forms in the courtyard. The schedule of the project from concept to construction was condensed into just ten months. In 1993, the firm began designing what would become the most complete (and badly maintained) contemporary park and infrastructure in Manhattan—Hudson River Park. 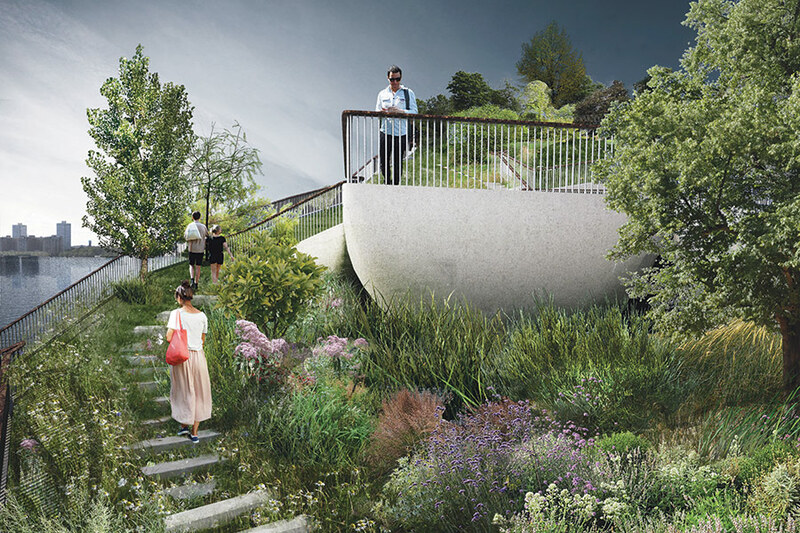 Now, they have been chosen to add to the park with the creation of a new freestanding Pier 55 that sits off the shoreline just north of the new Whitney Museum. 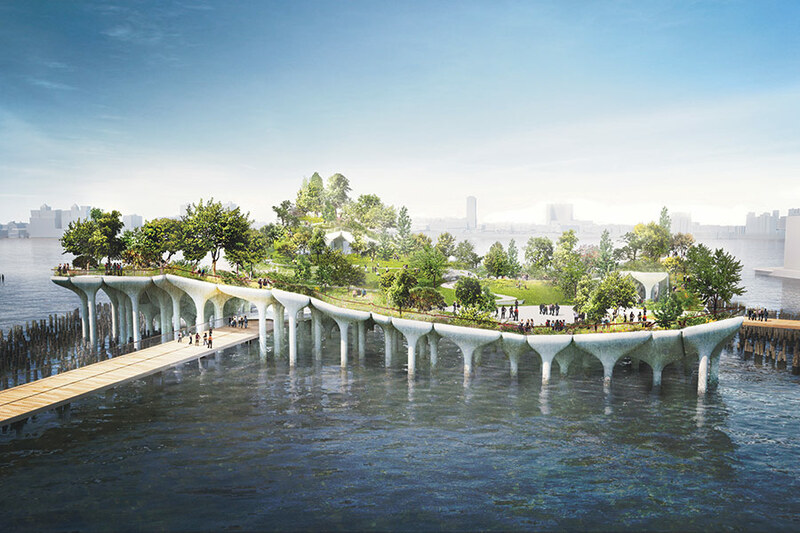 The Pier, which they are designing with the English Heatherwick Studio, is meant to be a 2.4-acre public park and performance space on the Hudson River. The form is conceived as a “leaf floating in the water,” and contains “an unexpected topography” of four lifted corners, each manifesting a landscape typology derived from their solar aspect, slope, and relationship to paths and performance venues. A variety of paths and stairs create circuits throughout the pier to maximize engagement and convenience for event-goers. The project is largely funded through a private donation of the Diller–von Furstenberg Foundation and is scheduled to begin construction in May 2016. Mathews Nielsen seems to be single-handedly transforming the South Bronx into a borough of green boulevards, parks, and pathways. Taking off from their South Bronx Greenway Master Plan, they have created a brilliant connecter from the area to the recreational facilities on Randall’s Island. It not only creates access to badly needed recreational facilities, but also increases the area’s green infrastructure by treating all storm water on site and using native, drought-tolerant plants to avoid irrigation. The quarter-mile connector runs from 132nd Street in the Bronx, underneath the Hell Gate Bridge viaduct piers, through a historic railway facility still in use, and over the Bronx Kill waterway to Randall’s Island. It includes a sustainable landscape, an at-grade rail crossing, pedestrian-bicycle improvements, and a pedestrian-bicycle bridge. Pedestrians and cyclists have a powerful landscape experience as they pass through the massive Hell Gate Bridge viaduct piers. The project will be open to the public fall 2015.